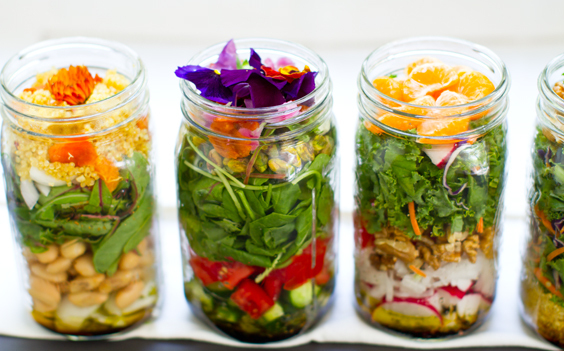 Salad In A Jar. The BEST New Way To Bring Your Lunch! My mind was dizzy with ideas. Grains, beans, greens, nuts, seeds, fruit, veggies, dressings .. so many ingredients to layer, stack and arrange. The best part is you can make five salads at a time, and they’ll stay fresh for the whole week, just grab and go on your way out the door! When lunchtime rolls around, you’ll be sitting pretty with your delicious salad ready to be shaken up. 1) BOTTOM – organic dressing (choose a different one for every day of the week). 2) Heavy ingredients that hold up well when submerged in dressing – beans, cucumbers, radishes, onion..
3) Heavy items that you may not want directly touching the dressing when stored. 4) Leafy organic greens/light ingredients – spinach, sprouts, kale, chard, arugula..
6) TOP – colorful ingredients to perk up your taste buds when you pop open the jar – fruit, edible flowers, herbs.. There are no exact “rules” and that is the fun part. Let creativity take over. What are you going to put in your salad jar?